Cantilever callipers attach to separate frame pivots on either side of the wheel. The inner-wire attaches to a carrier piece located above the tire. The carrier is pulled upward causing the calliper arms to swing inward. As Cantilever brake pads wear, they move upwards towards the top of the rim so new replacement pads should be set close to the bottom of the rim. The side pull calliper arms share a single pivot, which is centred over the wheel. Both brake pads move downward on an arc as they approach the rim. As side pull brake pads wear, they move downwards towards the bottom of the rim so new replacement pads should be set close to the top of the rim. 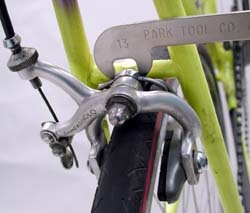 Dual pivot caliper rim brakes are used on many modern road bicycles. 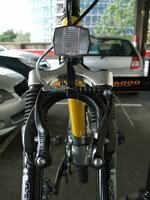 The design is a combination of a “centre pull” and a “side pull” brake. One caliper arm has its pivot off of wheel centre, the other arm pivots directly over the wheel centre. Left side and right side dual pivot brake caliper arms move on separate pivots. Pads move in different arcs as they approach the rim. The left side arm acts as a side pull. This pad swings downward as it travels toward the rim. As this pad wears thinner, it will travel downward even more. The right side acts as a centre pull. The right pad will travel upward as it approaches the rim. Set the right pad lower on the rim braking surface, and the left pad high on the braking surface. V-brakes are generally more powerful and easier to adjust than cantilever brakes but require a smaller gap between the brake pad and the rim surface. As V-brake pads wear, they move downwards towards the bottom of the rim so new replacement pads should be set close to the top of the rim. NOTE. 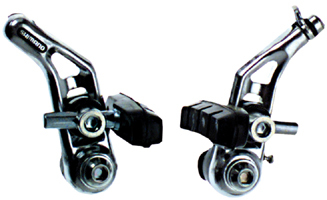 Due to their higher mechanical advantage, V-brakes require levers with longer cable travel than levers intended for traditional cantilever brakes so V-brakes cannot be used with Cantilever brake levers. 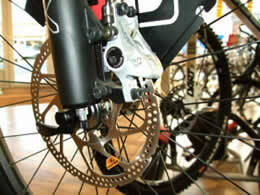 Disc brakes consist of a metal disc attached to the wheel hub that rotates with the wheel. 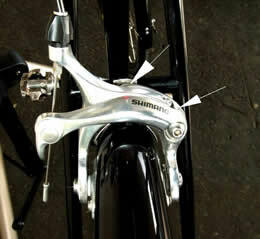 Calipers are attached to the frame or fork along with pads that squeeze together on the disc. Mechanical disc brake systems use callipers that are cable actuated, similar to rim calliper brakes, with an inner brake wire and housing pulled by a brake lever. Disc brake systems use a calliper mounted near the dropouts of the frame or fork ends, and a rotor (disc) mounted to the hub. Hydraulic systems use sealed tubing to push brake fluid. The brake pads are housed in the calliper and are forced into the rotor. Whichever type of brake you use a simple 30 second check is all that is needed. First, check the amount of pad material that is in contact with the rim/disc, if it is worn – replace it! Second, make sure that the brake blocks are in contact with the rim only, not rubbing on the tyre or lipping below the rim. Third, have a look at the cables, if the cables are worn, frayed or rusty they will need replacement. Brakes are an essential safety item, if you are in doubt consult a professional bike mechanic.